Zanzibar and Pemba Island are the perfect place to explore the Indian Ocean’s marine life. 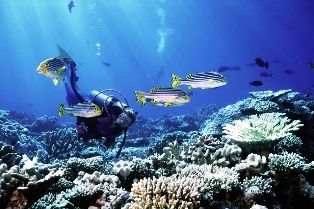 The Island offers magnificent deep sea diving ground. Experienced divers have an opportunity to explore pristine coral structures with abundant marine life and the relatively frigid unspoiled waters of the Indian Ocean. The deep waters of the Indian Oceans along Tanzania's coast are rich in big game fish, from Marlin and Tuna to swordfish and biting Barracudas. Besides the big game fish, Grouper, Red Snapper and other local species are popular along the coastal waters.